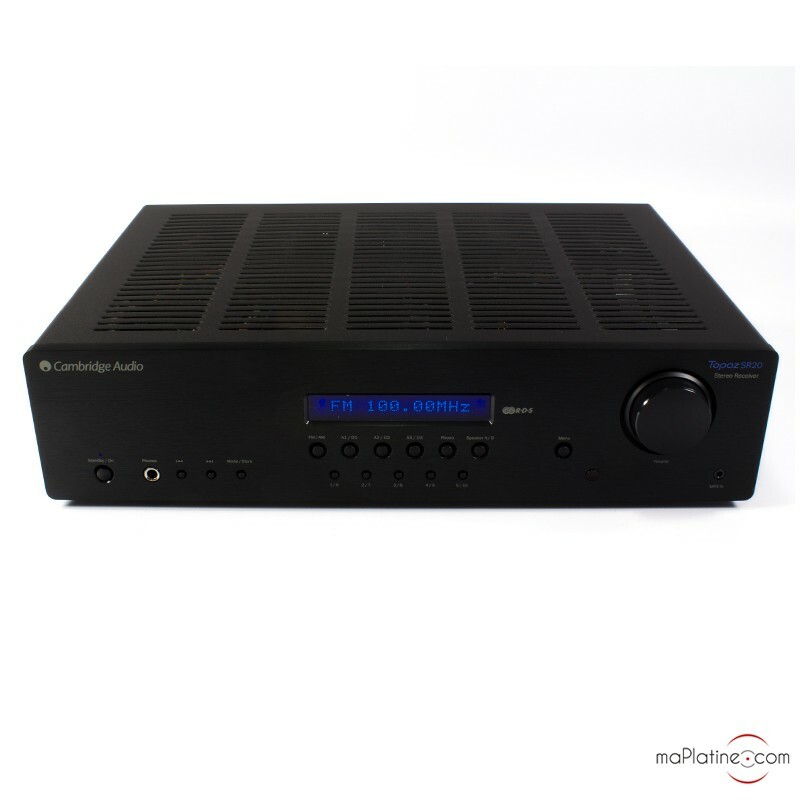 The Cambridge Audio Topaz SR20 integrated amplifier is a beefed up version of the Cambridge Audio Topaz SR10 amplifier. 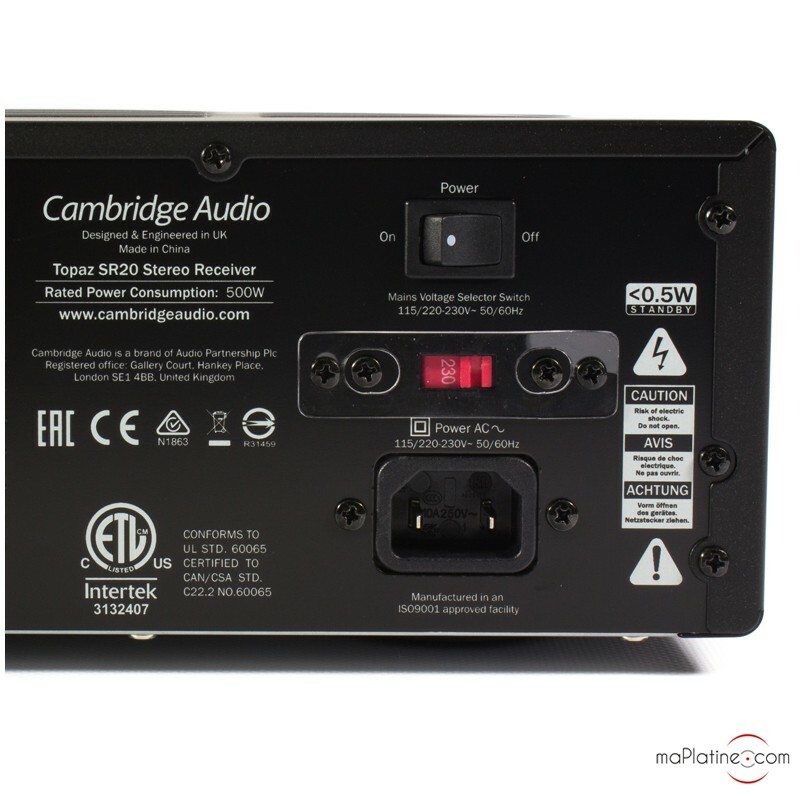 Not only does the Topaz SR20 have an increased output of 2 x 100W (compared to the SR10’s 2 x 80W), but it also has an in-built digital-to-analogue converter (DAC), which the Cambridge Audio SR10 does not. 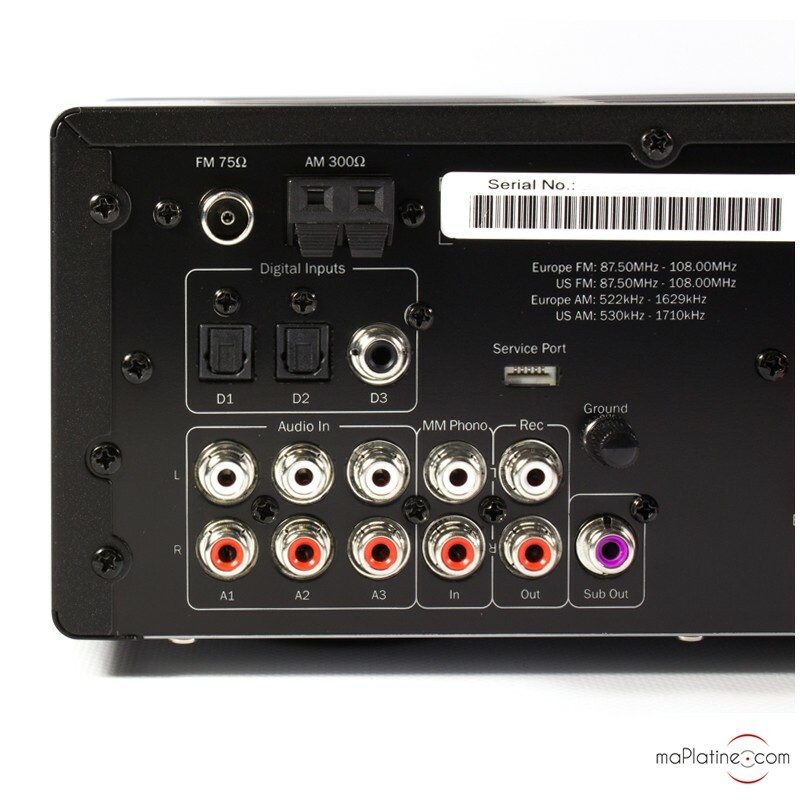 On the front panel, there are a number of buttons which you can use to select your digital and analogue sources. Above the buttons is a screen which displays the source you have selected. There is also a headphone output (6.35mm jack) on the left of the front panel and a volume dial on the right. 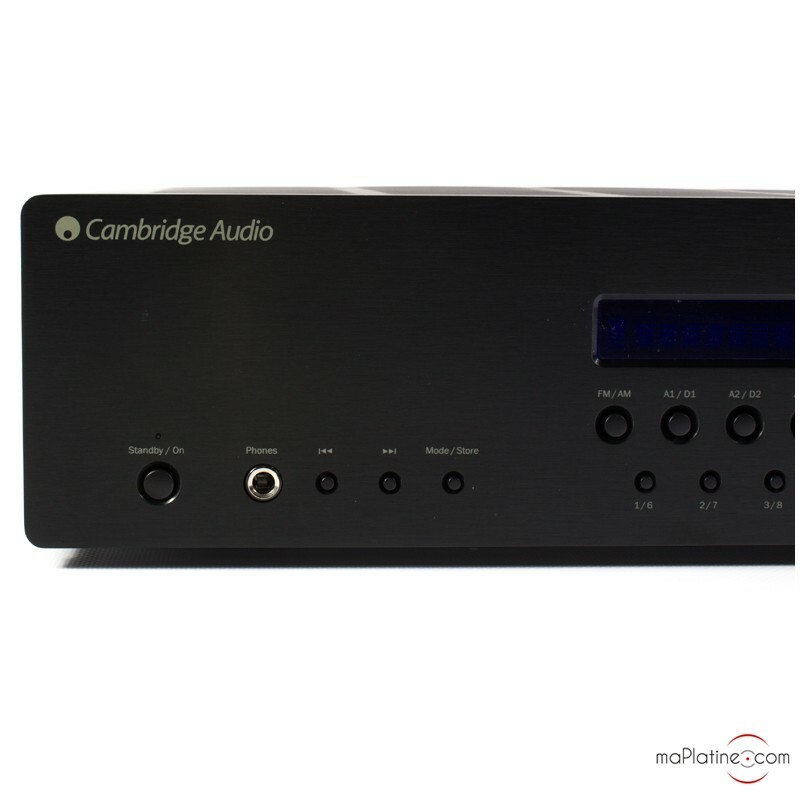 The Cambridge Audio Topaz SR20 amplifier is a fully comprehensive product, with 3 analogue inputs, 3 digital inputs (2 x optical and 1 x coaxial), 1 MM phono input and 1 3.5mm MP3 jack input. It also has a 75Ω antenna output for FM radio. 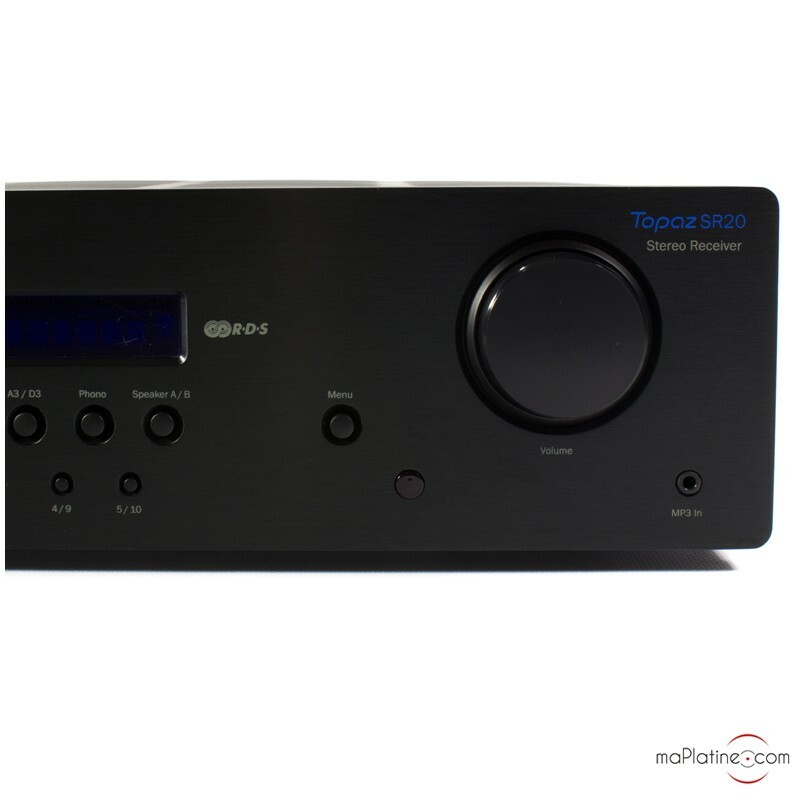 The 2 Toslink optical inputs accept sampling rates of up to 96 kHz and the coaxial S/PDIF input accepts sampling rates of up to 192 kHz. It also has a rec out. 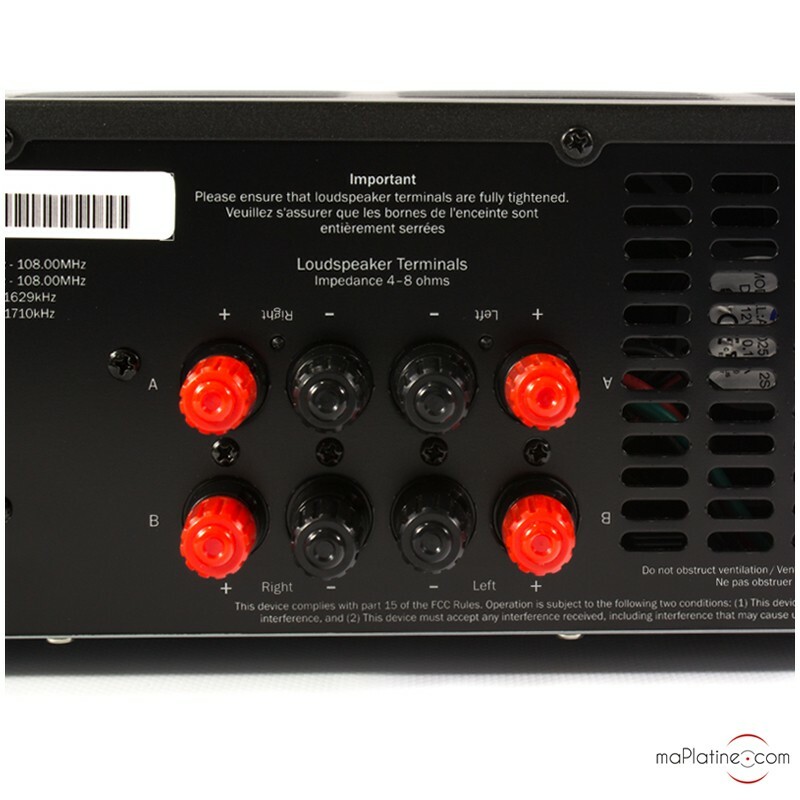 A subwoofer output also enables you to add a subwoofer if required. 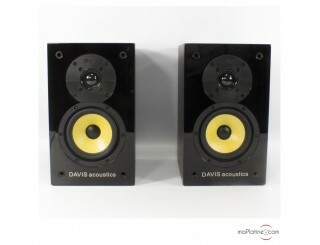 It has 4 pairs of terminals, which means you can connect it to 2 pairs of speakers for 2 different areas (e.g. 1 pair in the living room and another in the kitchen). 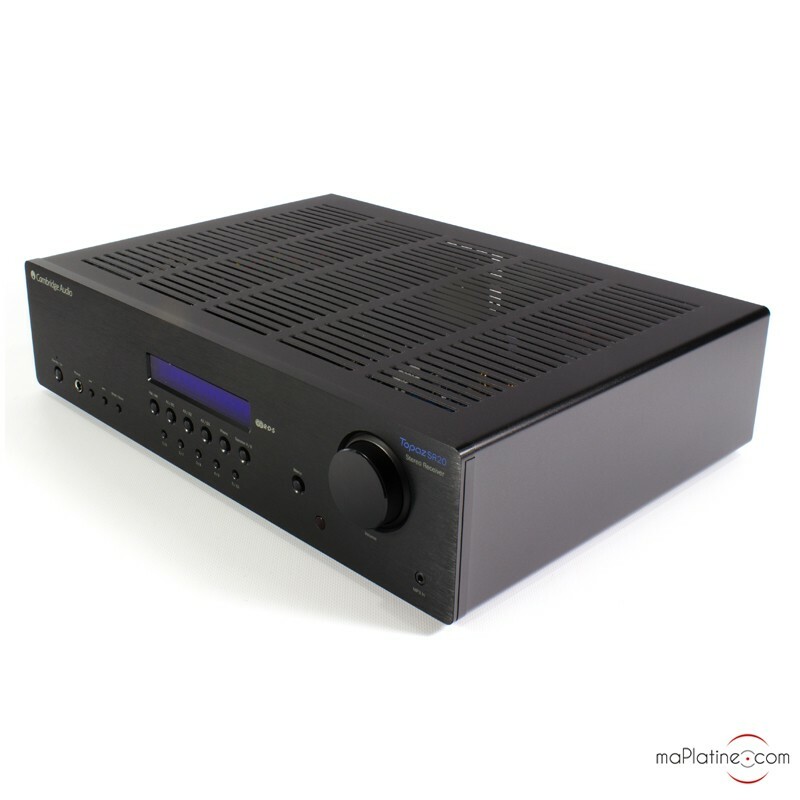 It uses the excellent Wolfson WM8728 DAC for digital-to-analogue conversion. It is driven by a powerful toroidal transformer, which means it can handle even the most demanding large speakers. This transformer is fully shielded to prevent all internal and external inference and preserve the output and signal quality. As it is made up of components that are particularly sensitive to vibration, the low resonance metal body has been acoustically damped. 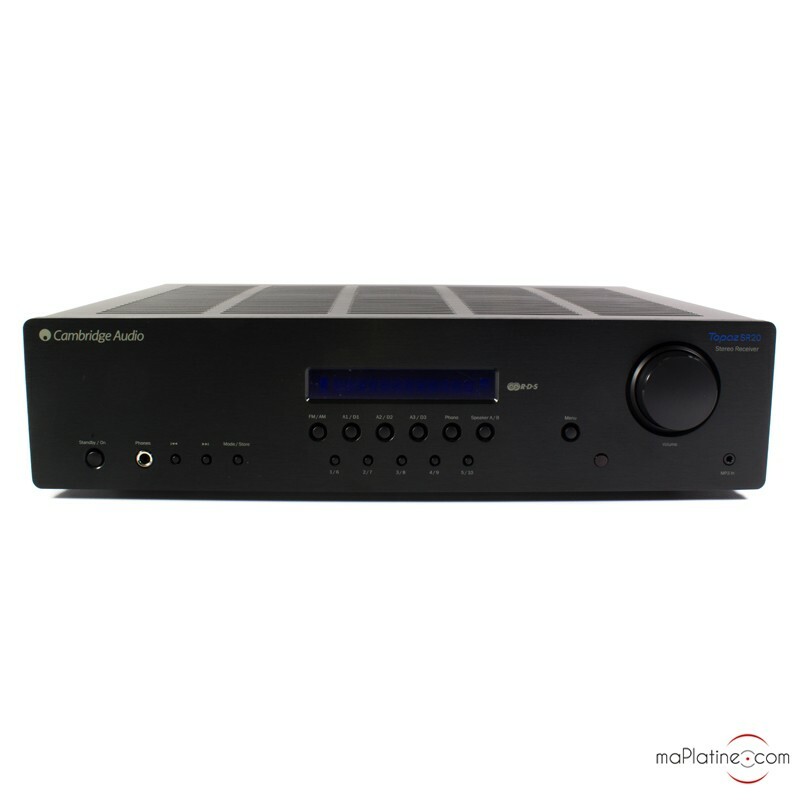 On top of its numerous inputs (digital and analogue), the Cambridge Audio Topaz SR20 amplifier is compatible for use with great number of the high quality speakers on the market. 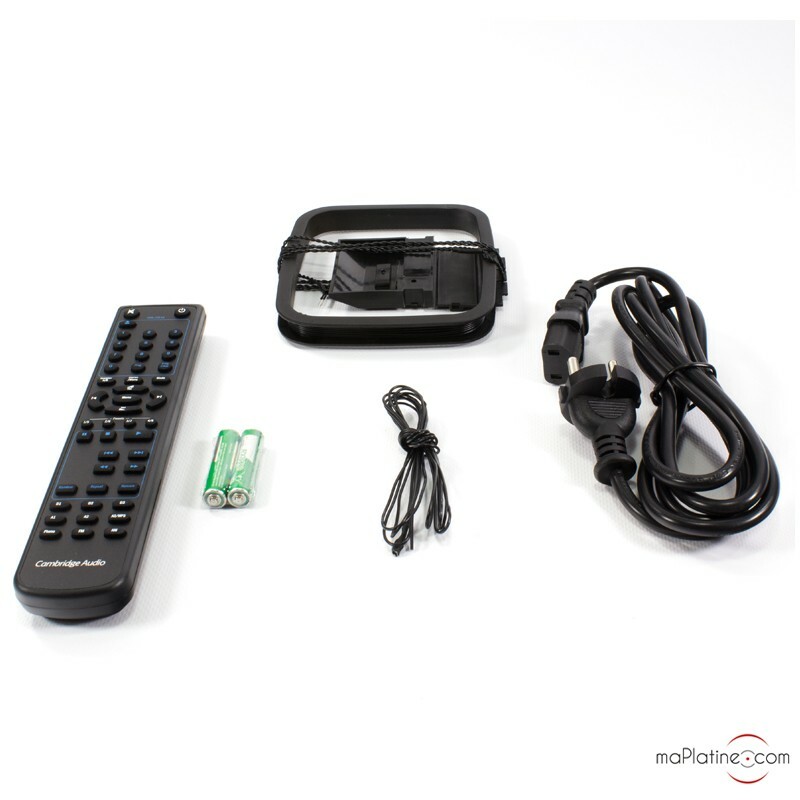 Its phono input and radio tuner are also some of its key assets. 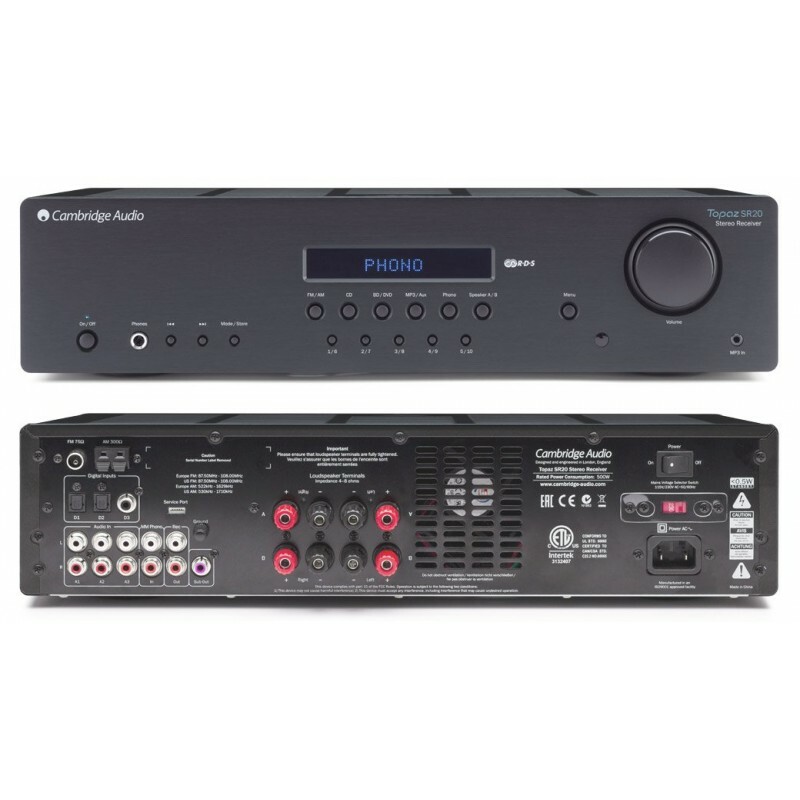 In terms of sound quality, it has all of the characteristic qualities that have made Cambridge Audio into the global Hi-Fi leader it is today. The bass is full-bodied and the timbres are bursting with warmth. At this price, there’s absolutely no competition! A best buy!